Background: The aim of this study is to evaluate the outcomes and prognostic factors in patients with hepatocellular carcinoma (HCC) and Child–Turcotte–Pugh (CTP) class B liver function after stereotactic ablative radiotherapy (SABR). 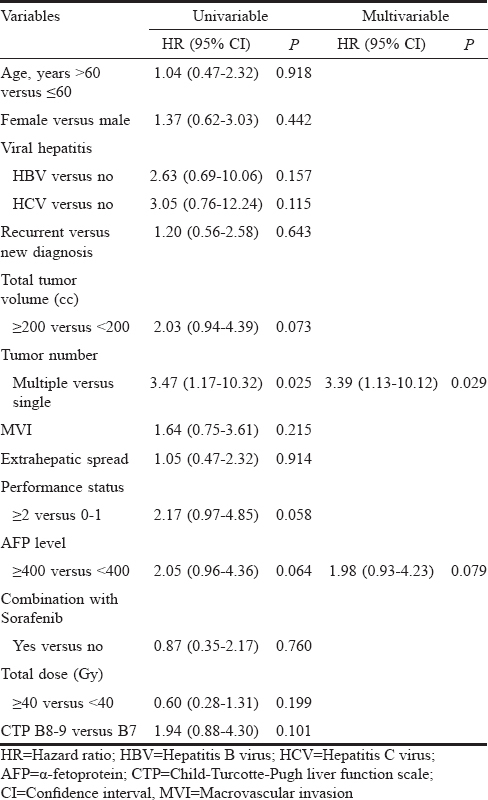 Materials and Methods: This retrospective study evaluated patients with HCC and impaired liver function who underwent SABR between December 2007 and August 2016. All patients had CTP class B liver function before treatment. Local control (LC) rate, overall survival (OS) rate, prognostic factors, and radiation-related toxicity were evaluated. Results: This study included 34 patients. The majority had a CTP score of B7 (52.9%) and advanced HCC (91.2%). The median survival time was 4.8 months, and the 1-year OS rate was 21.4%. Only the tumor number (multiple vs. single) was identified as an independent predictor of survival. The 1-year LC rate was 95.8%. Eight patients (23.5%) developed the radiation-induced liver disease, and 15 (44.1%) had a CTP score decline of ≥2 within 3 months. Other toxicities were generally tolerable. Conclusion: SABR may be considered as an alternative option for patients with HCC and CTP class B liver function, particularly for those with a single lesion. Stereotactic ablative radiotherapy (SABR) has been used to treat hepatocellular carcinoma (HCC) with minimal toxicity and sustained local control (LC). Limited prospective studies have demonstrated 75%–100% LC and 55%–94% survival at 1 year after liver SABR.,,, [4, SABR was an accepted treatment choice for early- and advanced-stage HCC. However, most patients in previous studies had favorable Child–Turcotte–Pugh (CTP) class A liver function with 1–3 lesions. SABR feasibility in patients with impaired liver function has not been well studied. We aimed to evaluate the outcomes of patients with HCC and CTP class B after liver SABR. This study was the Institutional Review Board (IRB) approved for analysis of HCC patients who underwent SABR at our institution between December 2007 and August 2016. This was a retrospective study, and therefore, IRB approval was obtained for waiver of consent. Our inclusion criteria were as follows: (1) noninfiltrative HCC, (2) CTP class B liver function, (3) nontumor liver volume ≥700 cc, (4) no previous history of liver radiotherapy, and (5) no other active cancer within the 5 years before SABR. The diagnosis of HCC was made according to the histological or radiological criteria. All previous liver-directed therapies were accepted, except for liver transplantation. All SABR were carried out using CyberKnife ® image-guided radiosurgery system (Accuray Incorporated, Sunnyvale, CA, USA). The details regarding the preparation, simulation, and dose volume constraints followed the published report. Synchrony respiratory motion tracking (Accuray Inc., Sunnyvale, CA, USA) and abdominal compression to reduce tumor motion were used in the majority of the patients. The most recent multiphase dynamic magnetic resonance imaging (MRI) scans were loaded for image fusion to facilitate target delineation. The gross target volume (GTV) was delineated on the simulation computed tomography (CT) images. The planning target volume (PTV) was based on the motion management strategy. For patients with implanted fiducials, a margin of 0–8 mm was expanded from GTV. For patients without fiducials, asymmetrical margins of 3–8 mm in the axial direction and 8–20 mm in the longitudinal direction were adopted, which were based on organ motion. The prescribed dose was limited by normal liver volume, tumor volume, and the tolerance of adjacent luminal gastrointestinal organs. Clinical evaluations, liver function test, abdominal CT, and/or MRI were conducted at 1–3 months after the completion of SABR and then at 3–4-month intervals. The modified response evaluation criteria in solid tumors were adopted to evaluate radiotherapy response. LC was defined as the absence of progressive disease (PD) within or at the margin of PTV. All other recurrences within the liver were classified as an intrahepatic out-field failure. All diseases at any nonliver site were defined as extrahepatic failure. Toxicities were graded based on the worst episode after treatment, according to the National Cancer Institute Common Terminology Criteria for Adverse Events (version 3.0). Liver toxicity including radiation-induced liver disease (RILD) and CTP score decline was diagnosed after the exclusion of intrahepatic progression and was censored at the time of liver-directed therapies or transplant. All analyses were performed using SPSS version 17 software (SPSS Inc., Chicago, IL, USA). Overall survival (OS) was calculated as the time from the last fraction of SABR until death from any cause or last follow-up. Survival data were censored at the time of liver transplantation. The Kaplan–Meier method was used to compare the OS and LC rates; the differences between subsets were evaluated using the log-rank test. The univariable Cox proportional-hazards model was used to determine the predictors for OS. Variables with P < 0.1 in univariable analysis were included in the multivariable model using a backward stepwise logistic regression model. Treatment response and liver toxicity events were compared between different subgroups using Fisher's exact test. Differences were defined as statistically significant at P < 0.05. A total of 21 men and 13 women were reviewed and analyzed in this study. The median age was 67.5 years. Most patients had underlying viral hepatitis (88.2%), with hepatitis B virus (HBV) infection being predominant. Most patients had a CTP score of B7 (52.9%). Moreover, 91.2% had advanced HCC (Barcelona clinic liver cancer [BCLC] stage C or D), 55.9% had a macrovascular invasion, and 38.2% had the extrahepatic disease. Other patient characteristics are summarized in [Table 1]. Doses of 25–52 Gy (median, 40 Gy) in 4–5 fractions were prescribed to 64%–78% isodose lines. The most common regimen was 40 Gy in five fractions (7 patients), followed by 45 Gy (6 patients) and 35 Gy (5 patients) in five fractions. During the analysis, 28 patients died and six remained alive. Most patients died of HCC recurrence/progression (n = 18), other causes included esophageal variceal bleeding (n = 3), gastrointestinal bleeding (n = 2), liver failure (n = 2), intra-abdominal infection/sepsis (n = 2), and hemorrhagic brain metastasis (n = 1). The median follow-up for all patients was 3.9 months (range: 0.6–72.5 months) and 4.2 months for living patients. 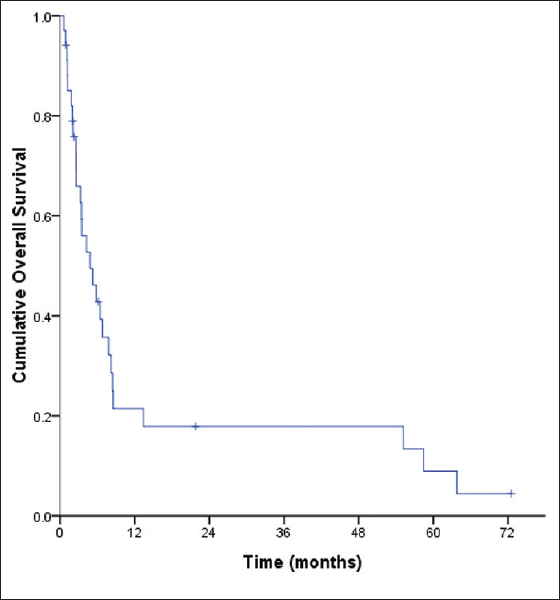 The median survival time was 4.8 months, and the 1-year OS rate was 21.4% [Figure 1]. There was no difference in survival between patients with and without macrovascular invasion [P = 0.335, [Figure 2]a, with a median survival of 4.2 and 5.8 months, respectively. Patients with CTP B7 had a trend toward better OS compared with those with CTP ≥ B8 [P = 0.095, [Figure 2]b, with a median survival of 6.5 and 3.5 months, respectively. Only the tumor number (multiple vs. single) was identified as an independent predictor of survival in both univariable and multivariable analyses [Table 2]. 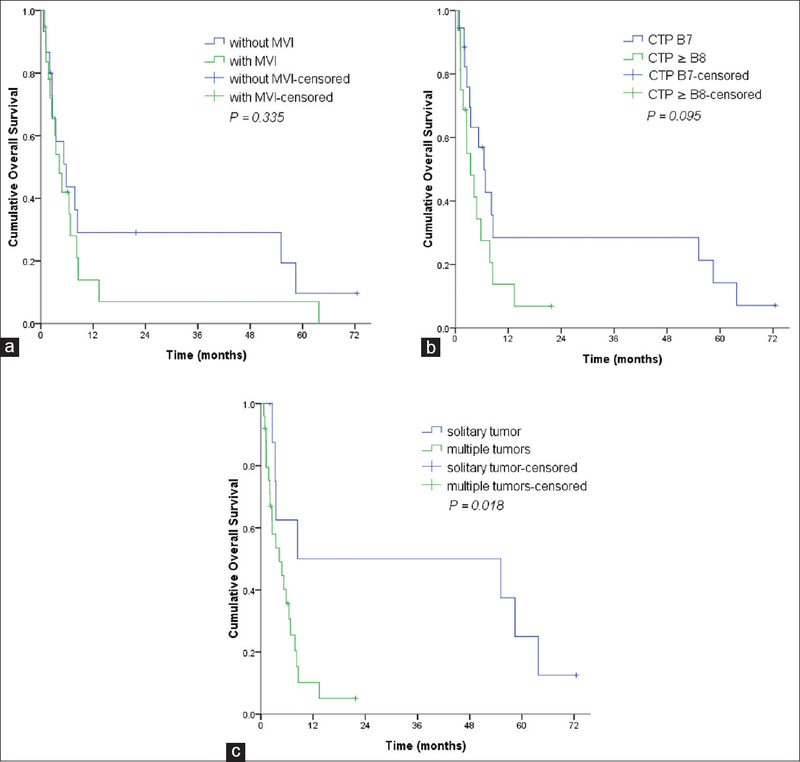 Patients with a single tumor had a significantly longer survival than those with multiple tumors, with a median survival of 8.5 and 4.2 months, respectively [P = 0.018, [Figure 2]c.
A total of 26 patients were evaluable for treatment response. The best responses of the primary tumor were a complete response (CR) in 7 patients (26.9%), partial response (PR) in 12 (46.2%), stable disease (SD) in 6 (23.1%), and PD in 1 (3.8%). [Figure 3] illustrates one patient who had CR after the SABR. Factors associated with treatment response (CR + PR vs. SD + PD) are shown in [Table 3]; none was identified as an independent predictor. Intrahepatic out-field recurrence was the main cause of treatment failure and was observed in 14 patients (53.8%). The 1-year LC rate was 95.8%. All patients received the planned SABR without interruption because of radiation-related toxicity. Acute toxicities are listed in [Table 4]. SABR was generally tolerable, with no Grade 4 or higher toxicity, except for RILD. Fatigue and abdominal pain were the most common adverse effects experienced. Eight patients (23.5%) developed RILD, which included nonclassic RILD (7 patients), and 1 patient fulfilled the criteria for both classic and nonclassic types. Patients with CTP B7 were less likely to develop RILD than those with CTP ≥B8, but the difference was not statistically significant (CTP B7: 3/18, CTP ≥B8: 5/16; P = 0.317). CTP score decline within 3 months was observed in 18 patients, among which 13 progressed to CTP class C. Patients with CTP B7 were less likely to progress to CTP class C after liver SABR compared with patients with CTP ≥B8 (CTP B7: 4/18, CTP ≥B8: 9/16; P = 0.042). The magnitudes of the declines in CTP score were 1 point (n = 3), 2–3 points (n = 8), and ≥4 points (n = 7); only four patients achieved their baseline CTP score after conservative care. The present study provides the outcomes of SABR for patients with HCC, CTP class B liver function, and most advanced disease. The suggested treatment in this population is sorafenib based on BCLC algorithm, with an expected survival of 4.5–5 months in patients with CTP class B., Other options of limited evidence included transarterial chemoembolization, radiotherapy, and multimodality management.,,, The best outcome was achieved using SABR. A prospective study by Cárdenes et al. reported that SABR for 11 patients with HCC and CTP class B liver function provided a median OS of 12.5 months. Culleton et al. revealed that the median survival of 29 patients with CTP B/C HCC treated with SABR was 7.9 months. The median survival in our series was 4.8 months, which is consistent with the outcome of historic control treated with sorafenib., Notably, portal vein tumor thrombosis, an essential prognostic factor, may determine the outcome after SABR. It presented in three of the 11 (27.3%) patients in the study by Cárdenes et al., compared with 24 of the 29 (82.8%) in the study by Culleton et al., and 19 of the 34 (55.9%) in our series. Patients with HCC and CTP class A liver function were appropriate candidates for SABR. It is one of the inclusion criteria in the largest prospective study. Although a higher proportion of toxicity was noted, patients with CTP Class B disease were successfully treated; lower doses were adopted for these patients in some series., A phase I/II trial by Lasley et al. reported the outcome of unresectable HCC after SABR. This study involved 38 patients with CTP class A and 21 with CTP class B with 65 lesions, and patients with up to three lesions with a total diameter of ≤6 cm were eligible. The initial prescription doses were 36–48 Gy in three fractions for all patients despite CTP scores. After the observation of increased toxicity in patients with CTP class B, the planned dose for the following CTP B patients was reduced to 40 Gy in five fractions, and patients with a CTP score of ≥8 were excluded from this study. A similar policy of dose prescription was seen in the study by Sanuki et al. They included 185 patients (CTP A, n = 158; CTP B, n = 27) unfeasible for surgery or percutaneous ablative therapies, with a single lesion of ≤5 cm. The planned prescription doses were 40 and 35 Gy in five fractions for patients with CTP class A and B liver function, respectively, with dose modification acceptable to meet constraints. More acute toxicities occurred in the 35-Gy group, which probably reflected a higher proportion of patients with CTP class B (52%) than the 40-Gy group (1%). Selecting appropriate patients with CTP class B liver function who may benefit from SABR is essential. In theory, radiotherapy is more tolerable for patients with baseline CTP B7 compared with those with CTP ≥ B8. This was reflected in improved survival and less toxicity in patients with CTP B7. Culleton et al., reported that the CTP score was an independent predictor of OS among patients with CTP class B liver function after SABR. The median survival of patients with CTP B7 was 9.9 months versus 2.8 months for those with CTP ≥ B8 (P = 0.011). In the aforementioned study by Cárdenes et al., the only factor associated with severe liver toxicity or death within 6 months was CTP ≥ B8 (P = 0.03). In the present study, patients with CTP B7 had a trend toward better OS compared with those with CTP ≥ B8 (median survival, 6.5 months vs. 3.5 months; P = 0.095). They were also less prone to progress to CTP class C liver disease compared with those with CTP ≥ B8 (P = 0.042). Accordingly, patients with HCC and mild liver impairment (CTP B7) may undergo SABR and such population warrant inclusion in future prospective studies. In the present study, only the tumor number (multiple vs. single) was identified as an independent predictor of survival. In our opinion, at least two rationales may explain this result. First, patients with a single tumor indeed had lower tumor burden than those with multiple tumors, which may transform into the survival difference between two groups. Second, the more spared nontumor liver volume may be achieved by treatment planning in cases with a single tumor, which may result in better tolerability and less liver toxicity. Toxicity is always the main concern when considering the treatment. It is well known that patients with CTP class B liver function frequently developed liver toxicity. In the study by Cárdenes et al., RILD developed in three of the 11 (27.2%) patients with CTP class B. Another prospective study reported that five of the 20 (25%) patients with CTP class B experienced ≥ Grade 3 liver enzyme elevation with ascites (nonclassic RILD) after SABR. Culleton et al. reported that three of the 29 (10.3%) patients developed ≥ Grade 3 liver enzyme elevation 1 month after treatment and 63% had a decline in CTP score by ≥2 points at 3 months. Our data are consistent with these studies: eight of the 34 (23.5%) patients developed RILD and 15 of the 34 (44.1%) had a CTP score decline of ≥2. These results stress the importance of patient selection, and more attention should be paid to patients with CTP class B after SABR. There are some limitations in our study. The single-institute retrospective design is prone to selection bias. Besides, most patients had advanced-stage HCC and HBV infection, which limit the extrapolation of the result to early-stage disease and nonhepatitis B endemic area. The heterogeneous dose range without strict dose prescription was partly due to the diverse position or size of liver tumors and variable normal liver volume or function in individual patients. Last but not least, short-term survival of our patients prohibits long-term image follow-up. The 1-year LC rate of 95.8% might be overestimated with only one or two series image follow-up. SABR may be considered as an alternative option for patients with HCC and CTP class B liver function, particularly for those with a single lesion. Further prospective studies are warranted to define optimal candidates for SABR. Bujold A, Massey CA, Kim JJ, Brierley J, Cho C, Wong RK, et al. Sequential phase I and II trials of stereotactic body radiotherapy for locally advanced hepatocellular carcinoma. J Clin Oncol 2013;31:1631-9. Kang JK, Kim MS, Cho CK, Yang KM, Yoo HJ, Kim JH, et al. Stereotactic body radiation therapy for inoperable hepatocellular carcinoma as a local salvage treatment after incomplete transarterial chemoembolization. Cancer 2012;118:5424-31. Lasley FD, Mannina EM, Johnson CS, Perkins SM, Althouse S, Maluccio M, et al. Treatment variables related to liver toxicity in patients with hepatocellular carcinoma, child-pugh class A and B enrolled in a phase 1-2 trial of stereotactic body radiation therapy. Pract Radiat Oncol 2015;5:e443-9. Méndez Romero A, Wunderink W, Hussain SM, De Pooter JA, Heijmen BJ, Nowak PC, et al. Stereotactic body radiation therapy for primary and metastatic liver tumors: A single institution phase i-ii study. Acta Oncol 2006;45:831-7. Scorsetti M, Comito T, Cozzi L, Clerici E, Tozzi A, Franzese C, et al. The challenge of inoperable hepatocellular carcinoma (HCC): Results of a single-institutional experience on stereotactic body radiation therapy (SBRT). J Cancer Res Clin Oncol 2015;141:1301-9. Huang WY, Jen YM, Lee MS, Chang LP, Chen CM, Ko KH, et al. Stereotactic body radiation therapy in recurrent hepatocellular carcinoma. Int J Radiat Oncol Biol Phys 2012;84:355-61. Trotti A, Colevas AD, Setser A, Rusch V, Jaques D, Budach V, et al. CTCAE v3.0: Development of a comprehensive grading system for the adverse effects of cancer treatment. Semin Radiat Oncol 2003;13:176-81. Hollebecque A, Cattan S, Romano O, Sergent G, Mourad A, Louvet A, et al. Safety and efficacy of sorafenib in hepatocellular carcinoma: The impact of the child-pugh score. Aliment Pharmacol Ther 2011;34:1193-201. Lencioni R, Kudo M, Ye SL, Bronowicki JP, Chen XP, Dagher L, et al. GIDEON (Global investigation of therapeutic DEcisions in hepatocellular carcinoma and of its treatment with sorafeNib): Second interim analysis. Int J Clin Pract 2014;68:609-17. Culleton S, Jiang H, Haddad CR, Kim J, Brierley J, Brade A, et al. Outcomes following definitive stereotactic body radiotherapy for patients with child-pugh B or C hepatocellular carcinoma. Radiother Oncol 2014;111:412-7. Feng YM, Wang X, Wang L, Ma XW, Wu H, Bu HR, et al. Efficacy and safety of combination therapy of chemoembolization and radiofrequency ablation with different time intervals for hepatocellular carcinoma patients. Surg Oncol 2017;26:236-41. Ray CE Jr., Brown AC, Green TJ, Winston H, Curran C, Kreidler SM, et al. Survival outcomes in patients with advanced hepatocellular carcinoma treated with drug-eluting bead chemoembolization. AJR Am J Roentgenol 2015;204:440-7. Zhao Y, Duran R, Chapiro J, Sohn JH, Sahu S, Fleckenstein F, et al. Transarterial chemoembolization for the treatment of advanced-stage hepatocellular carcinoma. J Gastrointest Surg 2016;20:2002-9. Cárdenes HR, Price TR, Perkins SM, Maluccio M, Kwo P, Breen TE, et al. Phase I feasibility trial of stereotactic body radiation therapy for primary hepatocellular carcinoma. Clin Transl Oncol 2010;12:218-25. Sanuki N, Takeda A, Oku Y, Mizuno T, Aoki Y, Eriguchi T, et al. Stereotactic body radiotherapy for small hepatocellular carcinoma: A retrospective outcome analysis in 185 patients. Acta Oncol 2014;53:399-404. Brade AM, Ng S, Brierley J, Kim J, Dinniwell R, Ringash J, et al. Phase 1 trial of sorafenib and stereotactic body radiation therapy for hepatocellular carcinoma. Int J Radiat Oncol Biol Phys 2016;94:580-7. Murray LJ, Dawson LA. Advances in stereotactic body radiation therapy for hepatocellular carcinoma. Semin Radiat Oncol 2017;27:247-55. Tsai CL, Liu WL, Hsu FM, Yang PS, Yen RF, Tzen KY, et al. Targeting histone deacetylase 4/ubiquitin-conjugating enzyme 9 impairs DNA repair for radiosensitization of hepatocellular carcinoma cells in mice. Hepatology 2018;67:586-99.